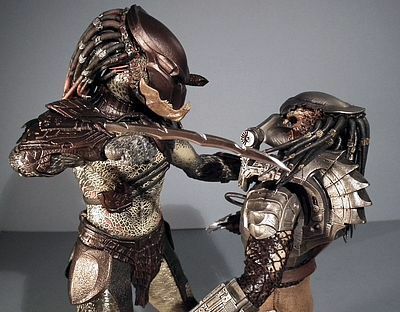 Jeff has a sneak peak of another terrific Hot Toys Predator today - take it away, Jeff! Well here we go again, after the scoop last month on the DX Jack Sparrow I received another release slightly ahead of the game. I always like to get some thoughts down on the figures strengths and weaknesses rather than running with a simple photo-review, but because of the speed at which I need to do this and the already late hour this may turn into me spewing a stream of consciousness. If so I apologise, but hopefully there will be a few insights along the way! Anyway, I now have the ugly mother f**ker in my hands, and it’s a figure that a select few of you will actually already own. Well, if you were lucky enough to pick up one of the even earlier preview figures made available at the Taiwan toy show in late November. 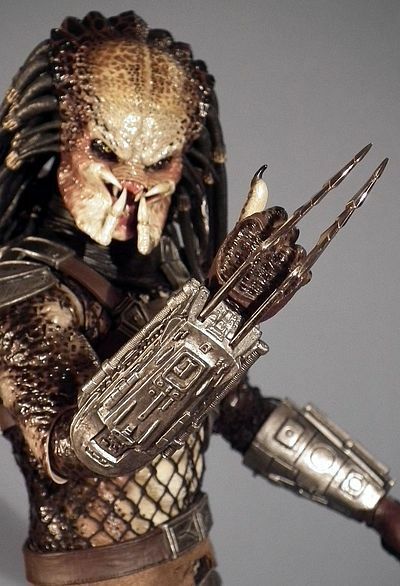 I wouldn’t mind betting that when it comes to favourite Predators from all the movies combined, that the iconic Stan Winston designed classic from the original movie is pretty much guaranteed to top the poll by well over 80% of true fans, and if you disagree then you are not a true fans. You see what comes first is invariably best in the world of movies. Sometimes something good will follow, like with the Godfather or The Empire Strikes Back… but I still think that on both those occasions the originals were at least as strong (in fact just a little better) than the sequels. The one I will concede is Toy Story 2, better than the first and basically reimagined for part 3, nuff said! The original is one of those movies that even people who think they don’t like sci-fi, fantasy or dare I say it ‘Schwarzenegger’ accidentally end up liking. It’s just a classic cinematic story with tons of action, a rampaging extra-terrestrial and a fully functional mini-gun… what more could you want? The other point (that might shock some of you) is that we are only a few weeks away from 2012 when the first movie will celebrate its 25th anniversary… scary huh, yeah we really are all getting THAT old! 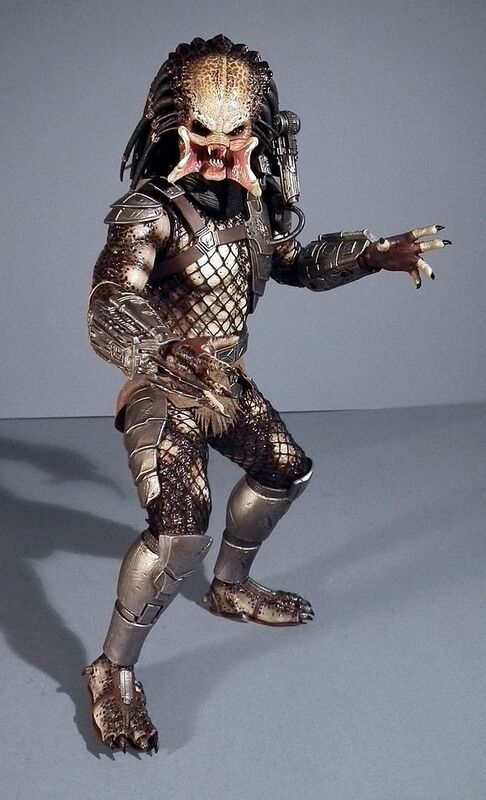 Of course the strange thing is that this isn’t actually the original Predator from the first movie… well, not officially, but it is the ‘classic’ Predator, even by name. 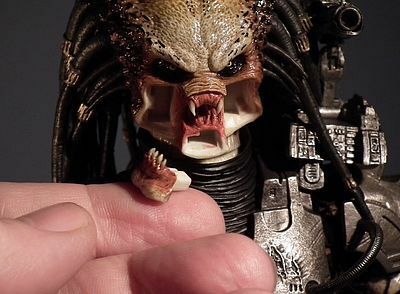 When Nimród Antal directed the movie under the guiding hand of Robert Rodriguez they decided to bulk up their ‘hero’ Predators and make them super pumped up steroid induced variations of the earlier versions. 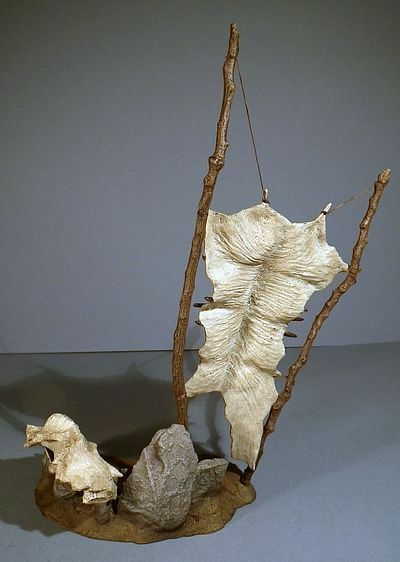 But they wisely decided to use a carbon copy of the Winston’s earlier creation as their ‘civil war’ foe. 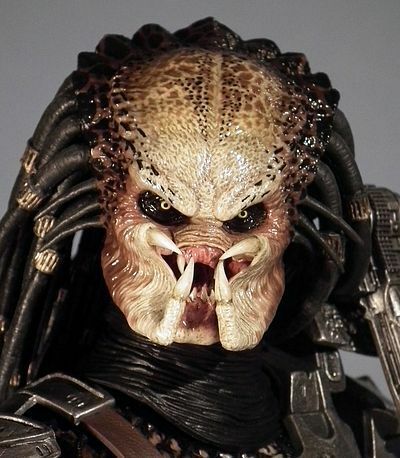 Therefor showing that race relations are as tricky to balance on the Predators home-planet as they are on our own. This mirrors the conflict that the human protagonists indulge in before uniting against their common enemy… although as the movie plays out we see that some just can’t put their past behind them. 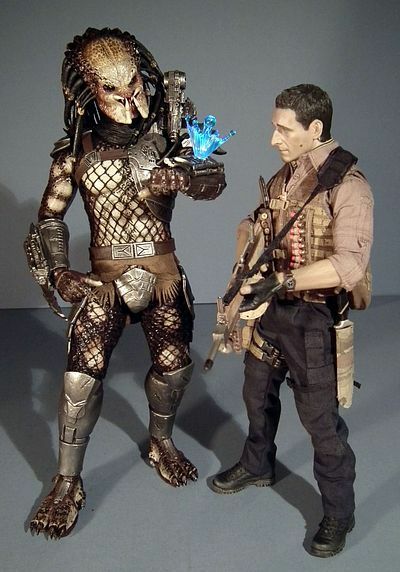 I’ve covered all the figures from Predators so far, first came Royce, covered here, then I did the Berserker and Falconer as a double whammy here. I also covered the Tracker, which just went live at the beginning of the week here. So, if you are a fan of the new movie it’s a no brainer that you will want this guy to complete the set. However, if you are more of a fan of the original, and you already invested in the figure from that movie… then is this version needed, is it truly that much of an improvement? I admit my shutterbug abilities aren’t up there with the best, so I heartily recommend looking over these stunning shots by Luka here. And OMG has also done an amazing job here. I’ve liked this range of packaging since we first received Royce and because this is part of that same series it follows exactly the same design ethos. So it’s the textured slip over sleeve with the red acetate window through which you can see the inner flap fronted box. Slip the plastic trays out from inside and there lays the figure next his numerous accessories. No twisties are used, so as long as you treat everything with care it can all be repacked to look as good as new. Comparisons are inevitable though, as he shares an ‘almost’ identical array of weapons and ‘almost’ the exact same minimalist wardrobe. And I hope it’s not considered politically incorrect or Predatorist to say that facially, these guys pretty much all look the same to me. 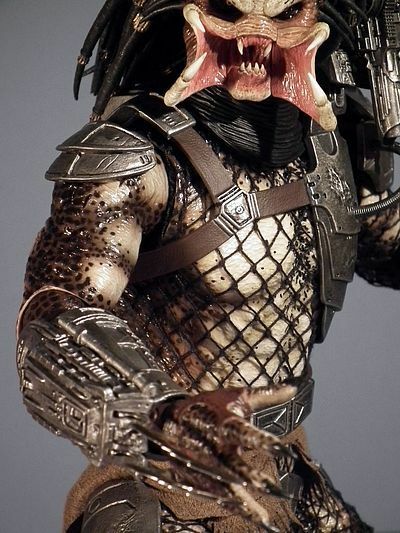 I can see the difference between him and the main protagonists from Pred 2, AvP, AvP:R and of course Predators, but it appears to be a fact that this guy could be the originals long lost twin… perhaps he is. Whatever the case he’s certainly from the same family, tribe or clan. However, the detailing and observations on this sculpt appear to be more finely tuned, just check out the original in my review for him here to see the subtle but important differences. And not only is the quality of the portrait closer to the source material, but the proportions of the head in relation to the body seem to reflect far more accurately the look of the character. It wasn’t till I stood the two versions together that I noticed just how big the first versions head looks, especially when wearing the helmet. 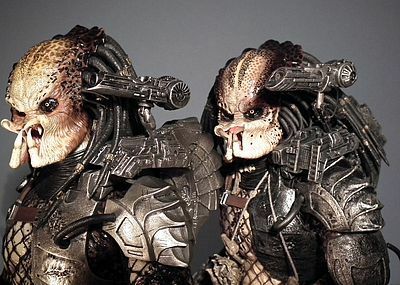 I know the original animatronic mask was pretty huge when placed on Kevin Peter Hall’s head, but now I see them side by side this seems like a much more accurate representation. The mandibles in particular are a triumph, both the roaring and the closed ones look better, with the closed ones looking so spot on, especially when viewed in profile. The dreads also hang with better weight and drape down much closer to the head. All six of the hands are well detailed and all swapped over with ease; I’m especially liking the new pointing hand, as it works great with the wrist computer. 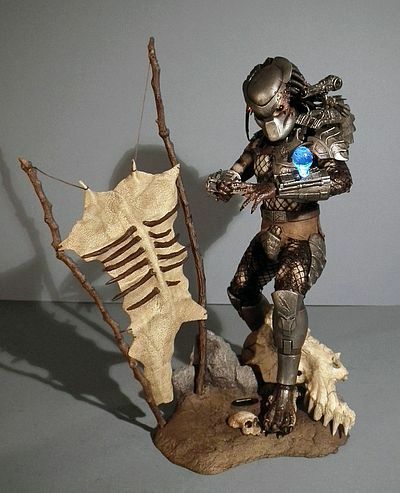 All in all this is a pretty outstanding piece of work, and once again Joseph Tsang has delivered a fantastic new Predator for our collections. And even if you do own the old one, I think you will enjoy owning both. As although the differences are subtle (to the untrained eye), they do look pretty cool together, like two members of a hunting party from the same clan. 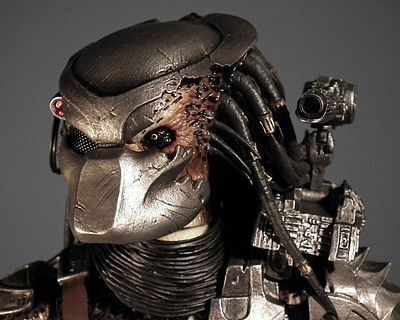 Hot Toys just keep getting better at Predators. The sculpts are increasingly stronger, and to truly show off those sculpts so are the paint apps! Back when I reviewed the original figure here (sculpted by Pan Mak) I was actually very impressed, but boy does this show how much things can come on in two and a half years! 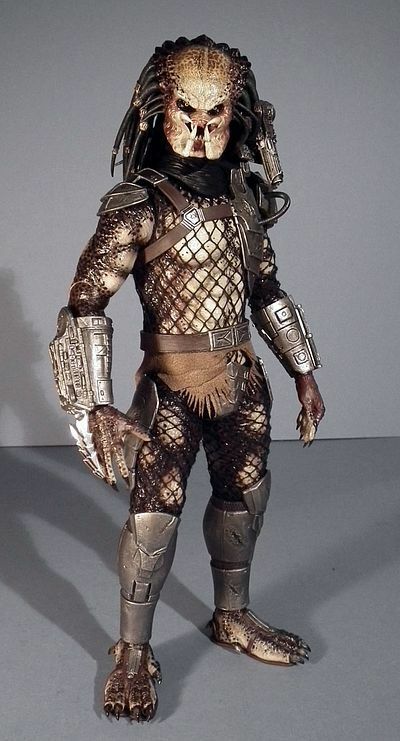 And of course, as I keep saying, although very similar, this is NOT that character, the paint job here was done to replicate how the old school Pred looked in the new movie. Everything just seems slightly more refined, from the subtle spotting and colouration on the forehead right through to the choice of colour for the interior of the mouth. Gone is the red-raw angry colour used before to be replaced with a more gentle salmon hue that softens and graduates as it spreads away from the teeth and out over the inside of the mandibles, and just check out the super fine thread veins painted on the inside as well, just amazing. The actual teeth/tusks are also displaying beautifully subtle variations in tone, as the white ivory of their main part dirties up around the root. But it’s not just these areas that are an improvement, the eyes also replicate the piercing yellow colour far more closely as they peer out from beneath that angry scowl (which is even more pronounced here as well). If I had the time I could sit and go into even more minutiae of the paint job, but with the hour getting ever later I’m gonna have to trust that my pics will help show off just how great this thing looks, because it truly does. 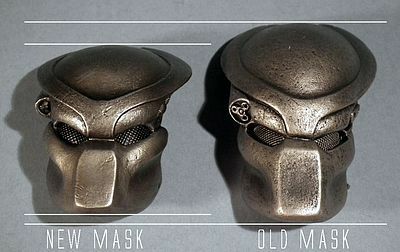 The body design is not new to me, or many of you, the reason being it was first used on the Con-Ex Shadow Predator that I reviewed here. I guess you could say that was his ‘trial run’, and as it didn’t throw up any major problems, here it is on the figure for which it was intended. So, due to the fact I am very much working against the clock I shall ask you to refer to that older review for an accurate low-down on his full range here. 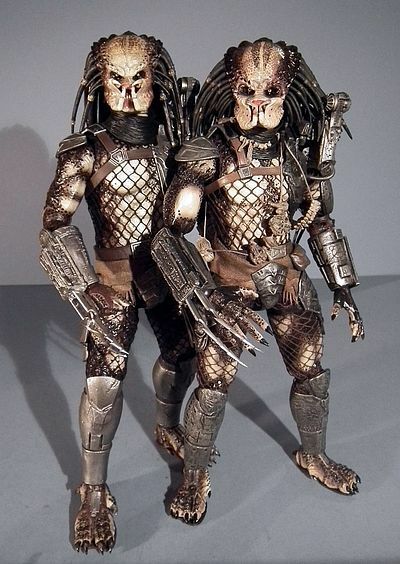 But if you own any of the ‘Predators’ from ‘Predators’ you will already have a pretty good idea of what to expect! It’s not quite up there with the original True-Type degree of mobility, but still affords a great range. 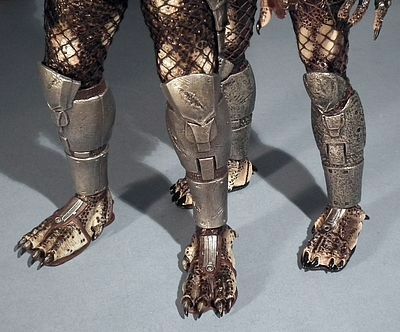 I did find that the design of the knee and shin guards impacted some on his ability to strike a deep squat… and we all know how those Preds love a deep squat accompanied by a throaty roar and fully splayed jazz hands. So as long as you bear these factors in mind you wont be too disappointed, but its definitely not quite a full score range of mobility. Most of the pieces are self-explanatory, like the hands etc. I found they swapped over easily and though extra wrist pegs are included. you won’t be needing them! The mandibles also swap with ease, and as long as you push them in firmly you can hardly see the division lines where they but up. The two holographic projections are a new feature. They simply slot into a pre made hole in an extra gauntlet panel that swaps over with the regular one. 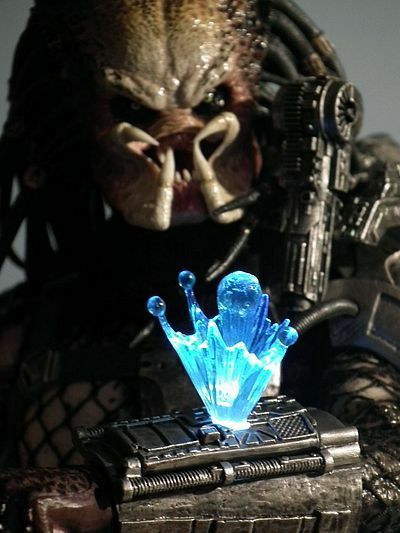 They both just have pegs that push into holes on the arm mounted gauntlet and with the flick of a switch they light up brightly with a cool blue ethereal glow (best viewed in dim light). He also comes with a rather nifty environment base. 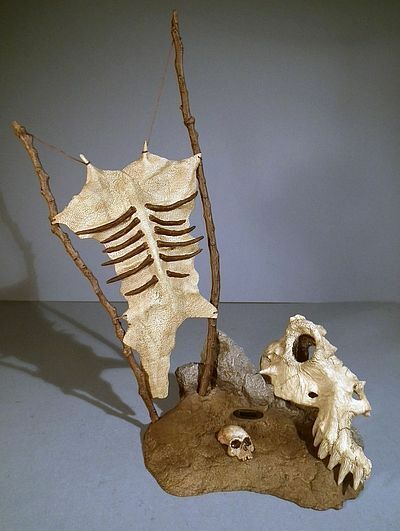 It’s made to mimic an area of the Super Predator camp and features the flayed hide of some unfortunate victim held taut between two posts that have been erected in the rock and dirt floor. Next to it is a section of what looks like a T-Rex skull and the top of a human skull is half buried in the earth between. It’s all nicely sculpted and painted very convincingly too. The two masks supplied fit tight and snugly to the head because of new way Hot Toys have developed for them to stay in place. 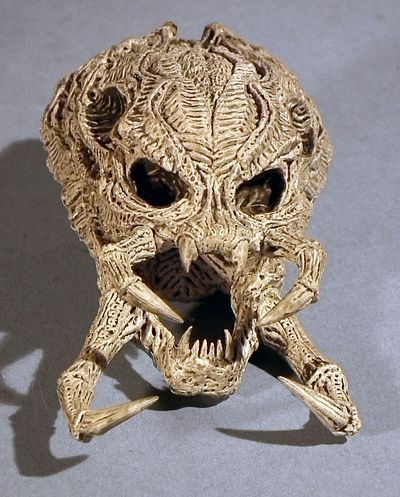 First you need to remove the mandibles and then you also pull out the chin from the face, it’s held there by a peg. You will now see the bottom jaws are in effect already glued within both the alternate helmets. So you just need to marry the slots up with the holes, push it firmly into place and it will hold tight. Now simply push the small plug at the end of the laser’s wire into the slot at the top of his backpack and you are ready to rock and roll. There is a tiny switch in the middle of his back that when flicked lights up the lasers with a fearsome brightness. I found the undamaged mask had a much brighter intensity, but to be fair both are pretty bright. I’m really liking this new way of attaching the masks, a simple solution, but oh so effective. 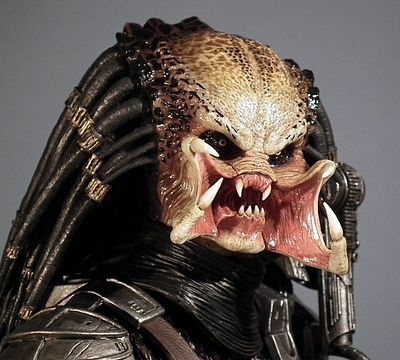 Which just leaves the extra ‘exclusive’ item, the Super Predator skull, you can tell it’s a Super Pred because of the long spidery mandible arms and the complex ridges that make up the forehead area. Its well carried out and beautifully observed, making another solid addition to our ever-growing 1/6th trophy cabinets. I also have to admit it’s one of those occasions when the exclusive item really helps boost the final score, and if you are getting the regular, I’d be tempted to knock a ¼ star off of the final. Of late Hot Toys has been incorporating working lights for the helmet-targeting laser, and once again we have that feature here. On mine it worked well and illuminated brightly with the flick of a well-placed and concealed switch on his backpack. There is a second feature this time in the form of the holographic projections I went over above in accessories. One shows Earth with its moon in orbit while the other depicts the moment the device is first activated and it scans through its archive looking for the right image to display. And like the lasers I found it lit up well, but is best appreciated in a dimly lit room. A great new feature in my most humble of opinions. Ah, there had to be at least one area where the first version could reign supreme, even if only by a whisker. There really is very little in it, but I like the fact that the first one had leather straps used to hold his shoulder armour in place whereas here it’s moulded plastic. And when viewed side by side the original ones armour just looks a little more weathered and used. I was however pleasantly surprised to see a number of revisions have been made on the armour between the two versions. The best way to see this is obviously to hold the two together, but this isn’t going to be an option for everyone so I’ll take a few pics to try and illustrate this. 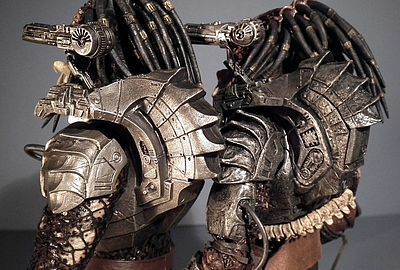 But things like the plasma canon and the fine mechanical tooling which incorporates some artistic ‘Predatorial’ ethnic tribal detailing over the gauntlets, shin guards and shoulder armour are all distinctly unique to this new character. The plasma canon has an articulated arm, so it can lie in its rest position or raise and turn from side to side, and the flexible cable is still there that links the chest-plate to the left shoulder pauldron. The left forearm gantlet has a long projecting set of twin blades, which on this occasion are real metal (the original had plastic blades), so this one earns extra merit for that. 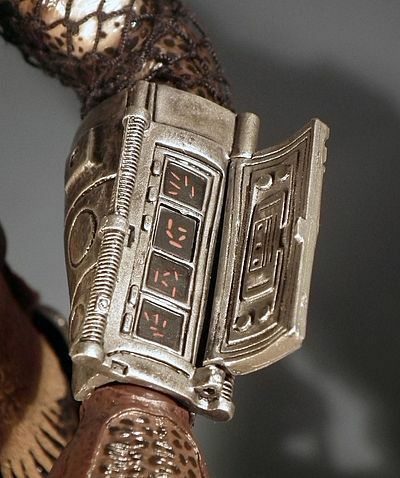 As mentioned above the left gantlet has panels that can swap over for the hologram projection and both have the opening flap to set the detonator. Everything fits well and is snug to the figures shape, so no real problems here. And even though I liked the leather straps on the old one, the moulded ones used here do aesthetically look just as good, and the use of real metal blades help keep this in the four star category! It’s a good solid release with a lot of play value for the big kid in all of us. The new body isn’t as ultra-poseable as the old style ones, but the trade-off is just how great it looks. 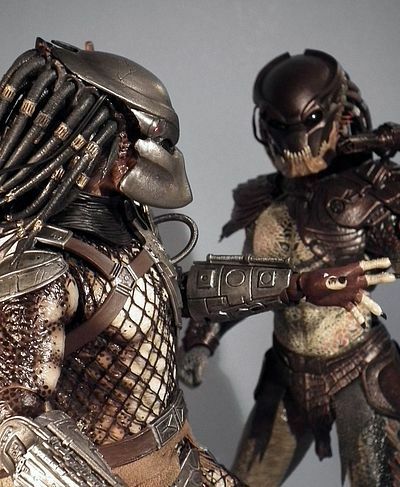 So, if you are buying this to round out your Predators display, and you now wait patiently for Noland to be released you’ll be a happy camper. 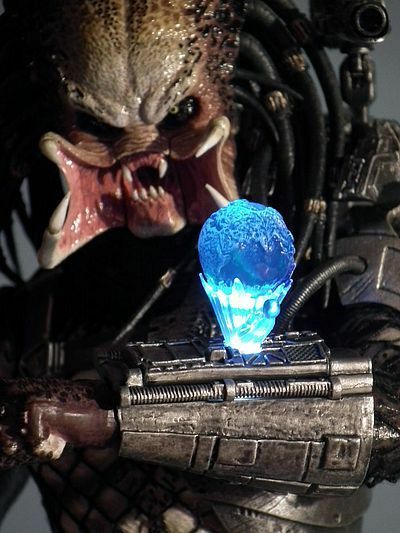 However, if you are one of those that have wanted the original Predator for some time now and have been watching the prices rocket ever skyward, you can breathe a sigh of relief. Because with just a few cosmetic mods and a couple of additions (gotta get that bone trophy jewellery somewhere) you have just saved yourself well over $100, and got a better figure to boot… how’s that not fun? On the Sideshow site this is available for the full RRP of $219.99 for both the regular and the exclusive editions. 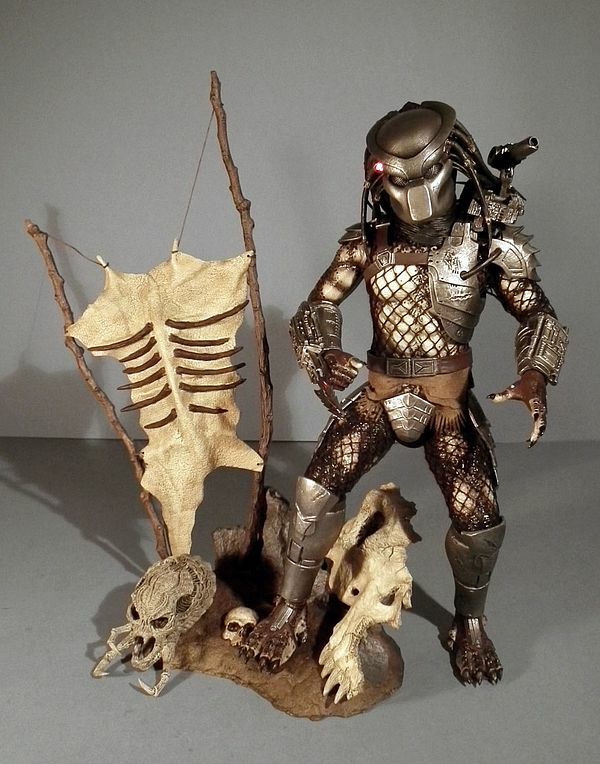 I have to admit, knowing how much the original Predator fetches on the secondary market (you’ll be lucky to find one for under $250, and can pay well over $300) I thought this one would sell out much faster. I really wavered on giving this the full whack four stars, and even though I was impressed by the cool new ‘hologram’ feature and the fact that the head and body proportions were all now far more accurate, I still found the $200+ price tag hard to equate with a full score unless there is something ground-breaking on offer. So the fact he gets the high score he does here is testament to the fact I really like this figure, and though as I said, nothing is groundbreaking it is still pretty outstanding! 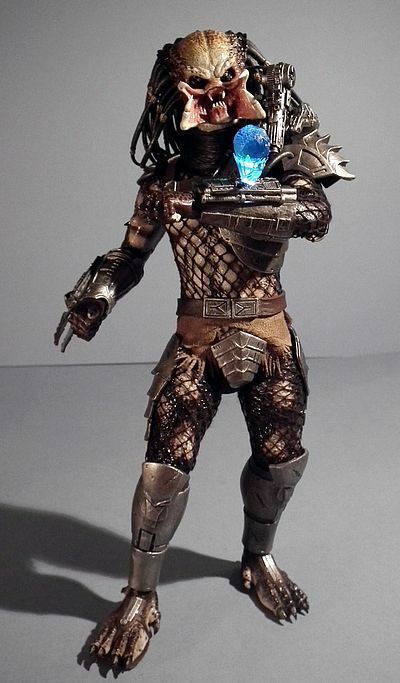 C’mon, it’s THE Predator in all but name, and it’s turned out even better than Hot Toys first attempt at the big guy. 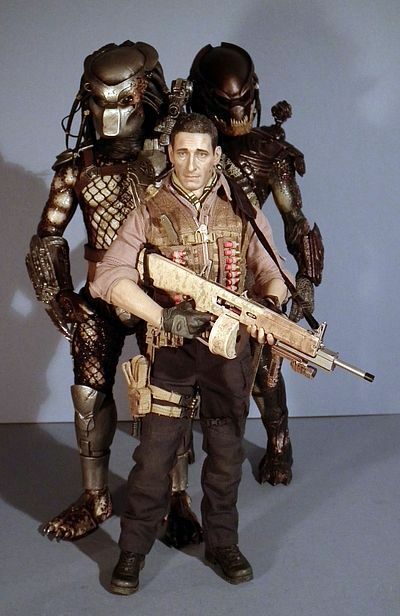 I’m sorry if you are a fan of the first movie, and perhaps believed in buying the ‘hero’ Predator released from it you had ticked the ‘ultimate’ box… sadly you hadn’t. And the reason is right here before you now. Well put simply this has an even more refined sculpt, the paint app is far superior and most importantly of all they have made the head to body ratio far more accurate to the movie. 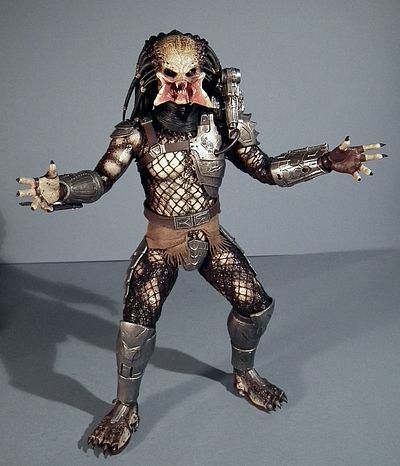 The price is hefty, but you can forgive it… well I can because now we finally have THE figure of THE Predator we have wanted for some time! 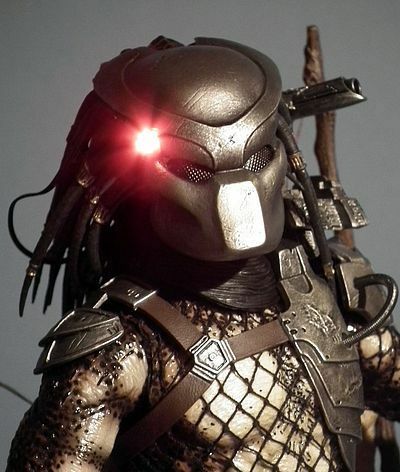 The only slight worry… well for some, (as I personally would relish it) is if Hot Toys do decide to revisit the original Predator with a souped-up deluxe version, but that might never happen! At the time of writing this review Sideshow still have both the exclusive and regular editions available for pre-order at the full RRP of $220, though I have a sneaky suspicion that might change soon… at least as far as the exclusive version goes. You can however save a few Christmas dollars by checking out Mike’s sponsors below for the regular edition. Or if you fancy spending even more try Hollywood Heroes, where the pre order is $229.99. And finally, as your last resort hit eBay where he’s hovering between $220 and $350 for the exclusive edition. I remember the days when you could get a bargain on eBay, especially when you factored shipping into the equation. It seems those days are long gone!